27 days until Spider-Man 3!! I never noticed that until you pointed it out! I was too focused on May pouring the tea, and the homey setting. That pic of Harry is one of the wallpapers on the official site. He's getting ready to roll! Bisty, you don't mind if I take that icon of Harry do you? I fell in love with it. I ended up writing a Harry oneshot, and I 'should have' been writing my 12 Days, which is still not finished yet. Harry's a broody sort. And "potentially"? Let's just say he's probably hearing those voices right there in that chair. How pretty -- I love the contrast between Harry's dark place and Peter's bright goofiness with Aunt May! Yay! Someone noticed that. 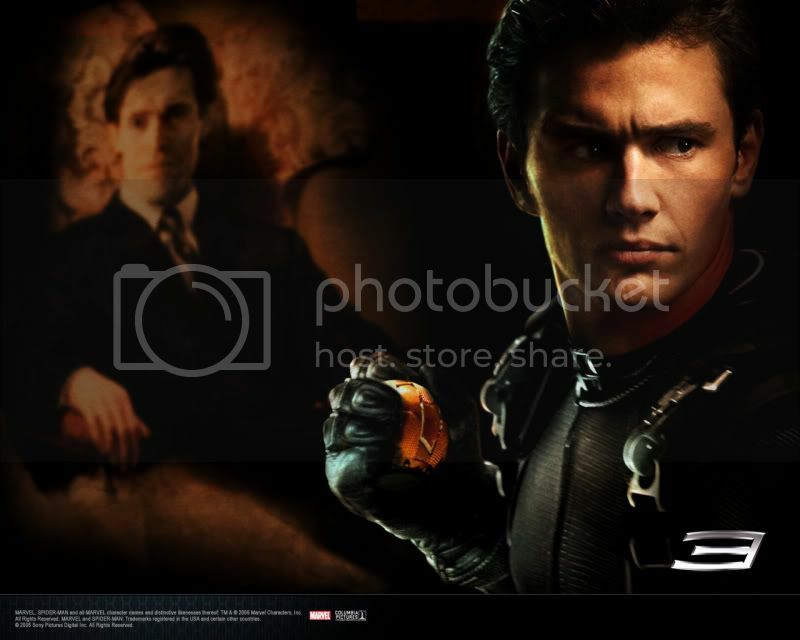 :) There are quite a few contrasts between the characters: Harry/Peter, Peter/Eddie, Gwen/MJ, even Peter and himself... it's definitely a sub-theme. I loved the pics. Of course anything Harry I do love, just not quite in favor of him turning into the Goblin though, and I don't 'care' if it's canon. Yeah, have to agree, Peter looks goofy in that pic, but gotta to love him for it. I'm just so glad him and MJ are together... but with what happens in the book... I want to gave them both a good talking to, or maybe just gave them both a good smack, but not too hard. Peter and May hug, Awww. Well, :P I like Harry turning into the Goblin. It's very fitting. But *shrugs*, probably knew how I felt, as I do for you! I think I'll be watching that preview a few more times myself. And then trolling the internet for cam-versions of the film after it comes out! And why am I looking for an evil centerpiece over the table on the last picture where Peter is hugging May? Dude, BW rocks my socks! He does look pretty delicious there. I'm very partial to evil!Harry. Much yummier than broody!Harry, IMHO. LOL! You would not believe the internal squeeing when I first saw the May/Peter scene on the 7-minute preview. My God, it's practically the same thing I imagined. Peter and May, what a lovely sight. This is a big moment in the film and what a gesture May makes for Peter. That's some aunt he has. And Aunt May's the cutest "little old lady" ever. I love Harry's intensity in this film - I'm a total fangirl over it, really. I also think I'm the only one in fanfic who writes May into their stories, I ♥ her so! 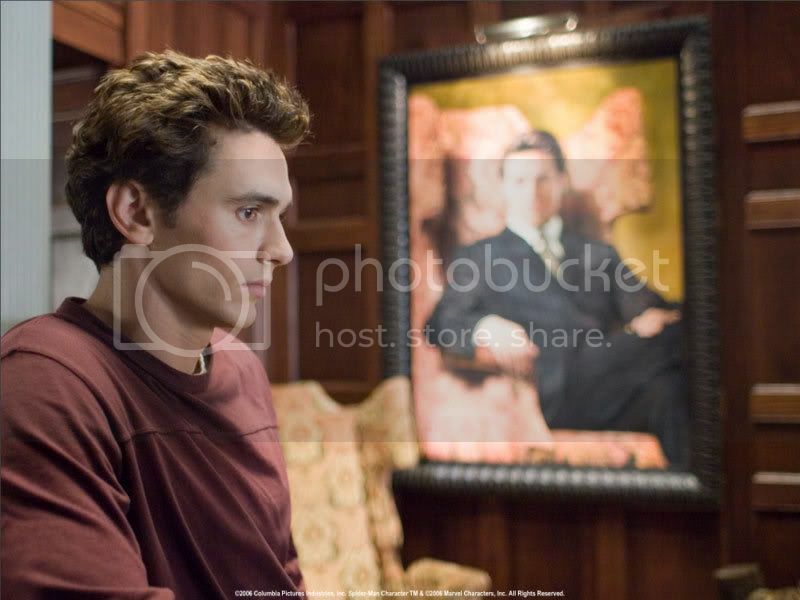 I know its a portrait of his father but in the first pic of Harry and the portrait behind him blurred my immediate thought was "ooh very Bruce Wayne". And I am Aunt May's biggest fan! Yay for a lot more Aunt May in SM3! Harry!!!! With the big portrait of his father... that was not for help him, huh?! Nope, Norman has never been much help... Bad, bad Norman.